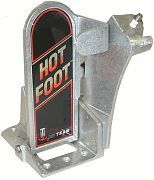 This is a newer version of the one and only HOT FOOT throttle - the original boat foot throttle that has been on the market for 30+ years. This throttle allows you to drive your boat like you do your car. You keep both hands on the wheel and control the throttle with your foot. The throttle returns to idle if you remove your foot. This throttle is a must have for safe operation of high performance boats. HOT FOOT Pro is the ultimate upgrade for the boater looking for safety and performance features that made Hot Foot™ the foot throttle boaters demand. HOT FOOT Pro sports a rugged aluminum finish with great color graphics on the pedal to accent any high performance boat. The top loading feature for the throttle cable* makes HOT FOOT Pro easier to install and gives more foot and leg room. Standard features include a patented idle stop for the Ficht and Optimax engines, stainless steel return spring, Teflon bushings on all critical pivot points and tow clip for added security.